CIEL: With iSpring, we create e‑courses almost three times faster! CIEL (Centre for Investment Education & Learning) is a learning solutions company focused on providing technical training for banks and financial services companies. They offer computer-based self learning modules, instructor-led classrooms, and a blend of both. Divya Changulani, CEO & co-founder of CIEL, shared her experience on how they managed to cut course production time and teach over 30 thousand people. Let’s find that out. — Divya, will you please tell us about your content department? We have a team of three people who work with authoring tools (Captivate, Articulate and iSpring), one creative designer, from 10 to 15 subject matter experts, and we have about five instructional designers including me. We are not a software company so we are not hugely invested in IT. We do have an IT platform in terms of an LMS, but we don’t have people looking at IT on the autoware sides. I don’t have somebody who can create a game in Flash, for example. — So, you create all the content yourself, right? Yes, that’s our core expertise, our core strength, and it’s entirely our intellectual property. So we don’t outsource at all. — What do you use e-Learning for? We started CIEL thinking that we would only focus on e-Learning. However, in India, the e-Learning concept was a little premature, because people love to meet, talk, and network. So we had to say “OK, we will not do just e-Learning, we will also provide face-to-face training.” Today we have more than 100 trainers working with us. CIEL provides trainings in wealth management or capital markets and investment products. The wealth management certification is one of our flagship certifications. We do a lot of e-Learning, but like I said, for the certification we have it in all three formats: we have a book that we have published, we have the online modules, and we also do classroom training. So it’s more of a blended learning solution. — What is the regular flow of your content? Our typical course is about 30-45 minutes of learning time. It typically includes 5-6 modules. One module consists of about 10 slides. For each module, we have an intro slide, then we have the content with interactions, a summary slide, and one quiz at the end of the module. Every module has at least one video and one interaction, so it is not very dry. We try not to bore learners with bullet points. — Do you know how many people have been trained with your courses? On the classroom side, CIEL has trained more than 150 thousand people within the last 10 years. As per the certification on the e-Learning side, I think there are easily over 25-30 thousand people taking our courses. — How was the creating of the content organized in your company before you started using iSpring? At first, we piloted outsourcing with an instructional design firm. However, the production cycle was very long; it took forever to create a course and send it back to us for review. Our clients weren’t ready to wait so long. Then we did some research and came across Harbinger Knowledge products like Elicitus and Raptivity. We found Elicitus very useful because it looked like a PowerPoint slide. So we found it very easy to copy and paste content from PowerPoint into Elicitus, because it gave us an interface which had slides. We used that for about 3 to 4 years, but after that we found another tool. We moved to Adobe Captivate because it had a very strong software simulation tool, and we could import PowerPoint slides. Our content and storyboards were designed in PowerPoint, so we would simply import and we were ready to go. We continued with Adobe Captivate for about 5 years. In the meantime we got a mandate from a client for about 80 courses, and we didn’t know how we would create so many courses in so little time. Even though Captivate has kept innovating itself, we continued our research on. 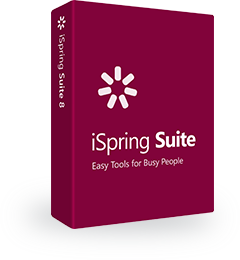 We went to all those websites which rank and recommend authoring tools, and that’s how we found iSpring. And then we were pleasantly surprised, because it was almost as if it had been sent to us by God! :) We found Captivate good, because we could import slides, but iSpring is actually in PowerPoint itself, so you don’t have any compatibility issues. — What has changed after you started using iSpring? Our course production used to take around 5-6 weeks. With iSpring, we were able to cut it down to almost two weeks. Also, CIEL is a non-profit company and every penny that we are able to save counts. For instance, one Articulate license costs $999 annually. For that amount, we managed to get three permanent iSpring Suite licenses. So it was a fantastic investment. — What iSpring features do you find the most useful? The quiz maker is beautiful, because it provides different question types. It allows you to include question groups and randomization, and that’s how we use it in our assessments for certifications. Each question can be provided with feedback, so learners are able to understand how they have performed. Another favorite of mine is the interactive dialogue simulation tool. And I cannot help mentioning the iSpring Content Library. Previously, the only complaints our clients had were about the fact that our courses simply looked like PowerPoint slides, even though we would try to innovate and come up with templates. For template creation, we had to hire an extra designer, who was a very expensive resource. Subscribing to Shutterstock for professional images is also expensive. Now, the iSpring Content Library gives us access to so many resources! It has templates that are already available in a ready-to-use way. If we created all that on our own, it would take us forever. So all this helps us to cut down our cost production cycle. I find that amazing. — Do your clients like the content you provide now? They do! They like it because the templates don’t look like PowerPoint slides; they are nice, more of a movie style, which is very engaging. Thanks to the fact that we don’t have tests with bullet points, they now look very different. Our clients are happy, and we are getting good feedback. — To whom would you recommend iSpring? I love the short time it takes you to respond to queries and the community; it’s fantastic! You guys are doing a fantastic job; I attend practically all of your webinars and ask questions. It is awesome. I would recommend iSpring to learning providers like us. There are lot of small clients who have invested very a huge amount of resources in their learning and development teams, and some of these teams are creating the content in-house. I think anybody who is into training, education or works for learning development departments of large organizations would like iSpring. iSpring is doing a fantastic job; I would rate it 10 out of 10.